The sleepy town of Panchgani is famous for the respite it offers from the harshness of urban pollution. But not many know it is also a dream destination for strawberry farm and fruit lovers! The dreamy, picturesque and serene views of the farms on the hills and valleys of Panchgani are the perfect anxiety killers! Add to this the satisfaction of lending a hand to the local farming community during the annual Strawberry festival; and you have a lifelong refill of tension-busting memories! Many fruit lovers head to this lovely hill station at this time of the year to enjoy mouthfuls of the blissfully delicious red fruit. Many excellent hotels, like Ravine Hotel, offer you a luxurious stay, within easy reach of the festival. 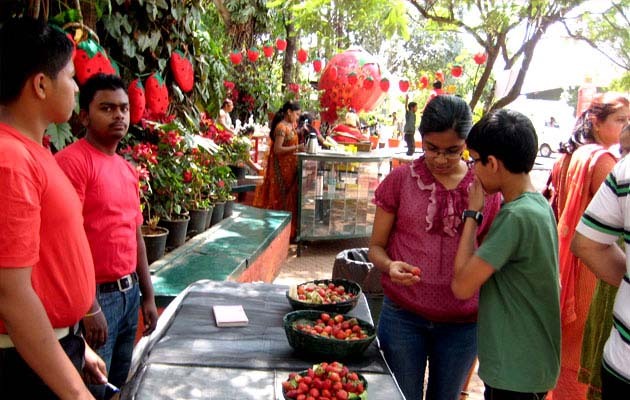 The Strawberry festival is held in Panchgani in the month of March/April every year. This year, it will be held between 18th to 20th April, over the Easter holiday weekend. This three-day event is considered pure heaven by strawberry lovers! The festival is organized by the leading strawberry farm, Mapro, at the famous Mapro garden. The strawberry is the main ingredient in numerous mouthwatering recipes. This heart shaped fruit is symbolic of love and desire. The mere thought of ambling through the rows of strawberries, beside you loved ones, and plucking the juicy fruit with your own hands brings a kind of freshness to the mind. You can make this tempting fantasy come true by attending the strawberry festival where you can eat as many fresh and juicy strawberries right off the plants as your heart can desire and your stomach can hold! Panchgani is famously called Strawberry Country. The temperate climate of this hilly region makes it a perfect location for the production of strawberries. Situated hardly 200 kms from Mumbai, it is a popular holiday destination to help you avoid the intensity of the Indian summer. Before India’s independence, the ruling Britishers had recognized the immense potential of Panchgani and established this hill station as their summer retreat to escape the humid climate of Mumbai. They also looked at it as a location for growing crops like strawberries. Later, the locals adopted the crop and continued to cultivate it over the years. Nowadays, the increasing demand for strawberries has started giving high returns compared to the other traditional crops. Today, Panchgani and the nearby regions that also include Mahabaleshwar, regularly generate more than 80% of India’s strawberry supply. The Strawberry festival is organized with the purpose of celebrating this prosperity and sharing the joy of growing this beautiful fruit. You can get the best varieties of strawberry like Sweet Charlie, Interdown, KamaRoza etc. along with the world-famous Mahabaleshwar Strawberry, all under one roof. The fun’s just starting… the best loved part of this event is the strawberry picking walk. Irrespective of their age, every person loves to walk along the rows of strawberry plants to pick the delicious, juicy strawberries they see. Nothing beats the taste of a fresh and juicy berry, picked right off the stem. The experience of walking in the cool climate of Panchgani and enjoying fresh strawberries of your choice is something that can only be felt rather than expressed. So get your walking shoes and join us to enjoy the Panchgani Strawberry Festival. Mouthwatering delicacies like Chocoberrywitch – a delectable dish of freshly picked strawberries, whole wheat bread and chocolate sauce; Strawberry chocolate pizzas – pizzas with strawberry toppings and rich dark chocolate; Strawberry “bhel” – a tempting mix of strawberries and corn, and several such exceptional concoctions are some of the irresistible strawberry-based dishes on offer. Besides this, you can also enjoy the traditional lezhim dance that helps enliven the celebration. Lezhim is an intricate form of dance that requires amazing agility and coordination. Other events, like a live orchestra crooning nostalgic Bollywood numbers; Dandpatta – a form of martial art; water color tattoo and Mehendi stalls, together with an exciting array of strawberry based products add to the fun of this festival. Enthusiastic fruit lovers, both from India and overseas, throng this event each year, booking well in advance with Ravine hotel, to ensure they get to attend this festival and fill themselves with fresh strawberries to their heart’s content! Eating fresh strawberries, plucked with your own hands, topped with cream and chocolate sauce is an experience in itself. It is the best way to enjoy the beauty of this fruit which is so full of flavor. So – book your stay at Ravine Hotel and head to Panchgani, to create an unforgettable memory!